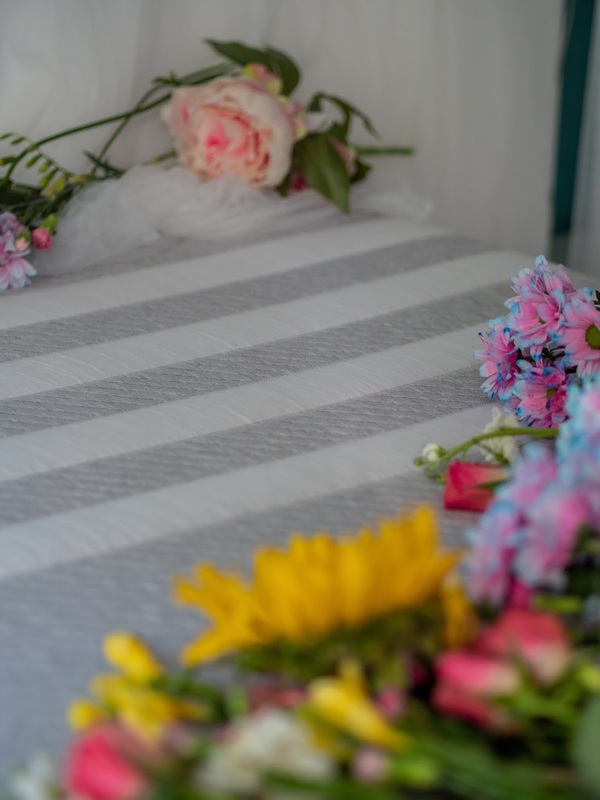 Obviously one of the most important things about a bed is the mattress - I learned a while ago that you can pretty much have any bed frame but the mattress is what determines whether or not you're going to sleep soundly. So, when the lovely people at Leesa got in contact and asked me to review one of their mattresses I was really excited to try them out! I had heard of the company before and was intrigued, particularly because I knew that it would arrive in a box! When it showed up on my door, you honestly wouldn't have thought there was a mattress inside. We pulled it out and it came in a long, rolled up sausage that looked very thin. My mum even turned to me and said, "Is that it?!" but once it was rolled out and it began to expand, she soon changed her tune. After lying on it for just five minutes she proclaimed it was one of the comfiest mattresses she'd ever laid on. And I have to say I am pretty much in love with my Leesa mattress. It's so soft and apparently has three foam layers designed for cooling, body contouring and pressure relief, which is probably why I've slept so well on it! Leesa also donate one mattress to charity for every ten sold, which I think is just wonderful. But how did I actually sleep on it? Well, I have to say it was amazing. I am very fussy when it comes to mattresses (I often cannot even sleep at my boyfriend's house because his mattress is so hard!) but I slept like an absolute baby on my Leesa. It sometimes takes a bit of time to get used to a new mattress but it didn't take long at all to get used to it. Over the month I found myself sleeping even better than before. I also sometimes sleep funny in the night which means I can get back and neck pain but I didn't have this at all. I think the foam layers really do help to support my body which means there were far less aches and pains (this was definitely a treat after I completed Race for Life and my body was the achiest it's been in a long time!). If you're looking to change your mattress soon, definitely check out Leesa, they are honestly amazing. Having a lie in during days off is even more of a treat now that my bed is so comfortable (I'm sure you can relate to that feeling of being so cosy that getting up just isn't an option anymore!). It's actually mind boggling that the comfiest mattress ever came out of a box that was dropped off on my doorstep! Have you ever tried a Leesa mattress? Let me know if you're considering them! This post was kindly sponsored by Leesa but all opinions and love of sleep are my own.